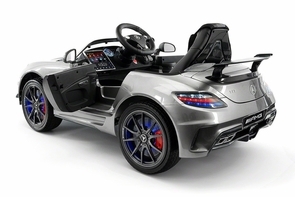 Ride on Remote control Mercedes AMG SLS 63 convertible measures 49 inches long, 30 inches wide, 22 inches high, and holds children up to 100 pounds! This ride on remote control Magic Cars® Mercedes 63 with real working television screen is a lot of fun for the home and outdoors. Based off of the real Mercedes SLS AMG, this big rechargeable battery operated ride on car is sure to provide many hours of awesome playtime. Want more? This ride on car comes with a full function remote control that lets you take control of the car right from your hand! Want to let your kid control the car instead? No problem, flip the switch in the car and the young driver gets full control. Watch the official Trend Times Magic Cars® remote control ride on RC car commercial below and enjoy what is so amazing today. Great for children ages 1-7 for just $549 for a very limited time. More great features include real working stereo, real working video player LCD TV screen, real rubber tires, MP3 player, headlights, taillights, SD card input, USB input, leather seat, opening doors, opening trunk, seat belt harness, and all weather rubber floor mats to protect your new Benz! Feel good! This Magic Cars® model arrives free with the best in class 1 year bumper to bumper ride on car factory warranty. Real full function wireless remote control allows you to go forward, backwards, left, and right with your child inside the car! The lights on the car are fully functional with tread on the tires. Children and adults want the amazing Mercedes SLS 12volt AMG Ride On Car for kids. You will love the authentic Mercedes logos and ornaments on the car. The superior design and quality of the Mercedes is perfectly transferred to this miniature version that is sure to turn the heads of everyone you drive it by. Choose from your favorite Mercedes colors such as white, silver, pink, or red. Combining the utmost care in safety with the maximum driving experience, this product leaves those other car brands trailing behind in the dust. Looking spectacular at all angles. The full size Mercedes SLS for adults can go from 0 to 60 MPH in under 4 seconds and the ride on version, with its superior styling and performance, will have kids feeling the same accelerating exhilaration as if they were in the real Mercedes SLS! Comes with remote control, foot accelerator, electric brake, forward and reverse gears and a top speed of up to 4 MPH. Product Size: 49" x 30" x 22"